Femoral neck fractures also result from falls, especially in elderly and osteoporotic females. They are associated with radial and humeral fractures. 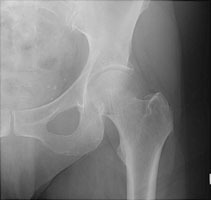 The Garden classification is widely used to categorize these fractures. Garden I is an incomplete fracture through the femoral neck while with Garden II, the fracture is complete. 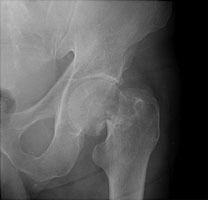 With Garden III fractures, there is impaction, and with Garden IV, the femoral neck is superiorly migrated relative to the femoral head. 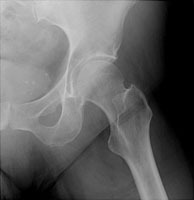 Garden IV fractures have the highest risk of avascular necrosis. 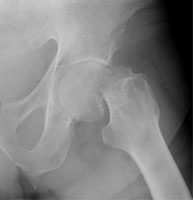 A AP view reveals a Garden II fracture of the left hip. B Lateral view of a Garden II fracture. C AP view of a Garden IV fracture of the femoral neck. D Lateral view of a Garden IV fracture.